Rich cities around the world are largely responsible for greenhouse gas emissions, says a new study. This is a change from traditional measures, which look at emissions from production of goods. When measuring these gases based on consumption, rather than manufacturing, the biggest emitters are mainly cities in North America and Europe. The study found their emissions were 60 percent higher than currently estimated. Researchers shared this information this month at a United Nations climate conference in Edmonton, a city in Alberta, Canada. About 750 city leaders, university researchers and scientists from 80 countries took part. They discussed the latest climate research and what local governments can do to fight climate change. Attendee Mark Watts is the head of C40, the organization that did the study. C40 is an alliance of more than 90 cities working to fight climate change. The study examined 79 cities that are part of the alliance. Watts said this newer method offers a fuller picture of greenhouse gas emissions by linking them to consumers rather than manufacturers. The new estimates put the responsibility on richer consumers and “increase(s) the scope of things that policy makers in cities” can do to lower emissions, he said. Cities use more than two-thirds of the world’s energy. 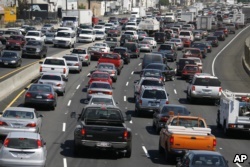 FILE - Southbound traffic on Interstate 5 moves through Los Angeles. The new estimate comes at a time when there is concern that national governments will not meet the climate promises they made in 2015 in Paris. 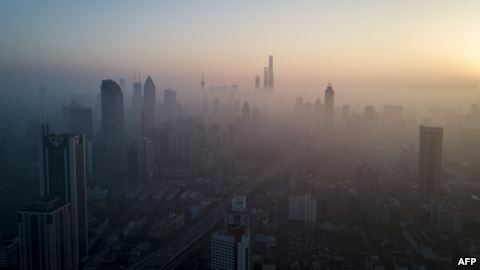 Traditionally researchers have considered manufacturing countries such as China and India among the top emitters of greenhouse gases. This study shows that the demand for and use of the products of such manufacturers is part of the overall process of greenhouse gas emissions. “But ... these are ideas whose time is probably almost imminent,” she told the Thomson Reuters Foundation during the conference. Sebastien Malo reported this story for Reuters. Alice Bryant adapted it for Learning English. Caty Weaver was the editor.